Aug. 8. Aspire Carolinas Foundation plans to build three schools for children with Asperger’s/autism, learning differences, and those looking for careers as well-qualified tradespeople. The total value of the project on Beatties Ford Road at Hambright will be in excess of $30 million at build-out. “These schools will offer educational options that are sorely needed, to give students a viable career path and our regional employers a new pipeline of skilled workers,” said Jennifer Nichols, executive director of the foundation. Rob Johnson of Boomerang Design is the architect; Burton Engineering is site engineer. A general contractor has not been selected. The location at Hambright Road and Beatties Ford was chosen based on access to major highways, proximity to multiple schools and resources such as Latta Plantation, Carolina Raptor Center and Historic Rural Hill. A house on the property is large enough to for the school start-up with “gentle modifications,” Nichols said. Building out the state-of-the-art campus will include renovating an existing house on the property, and building two new buildings, as well as adding playing fields, an outdoor classroom, a garden, and parking areas. 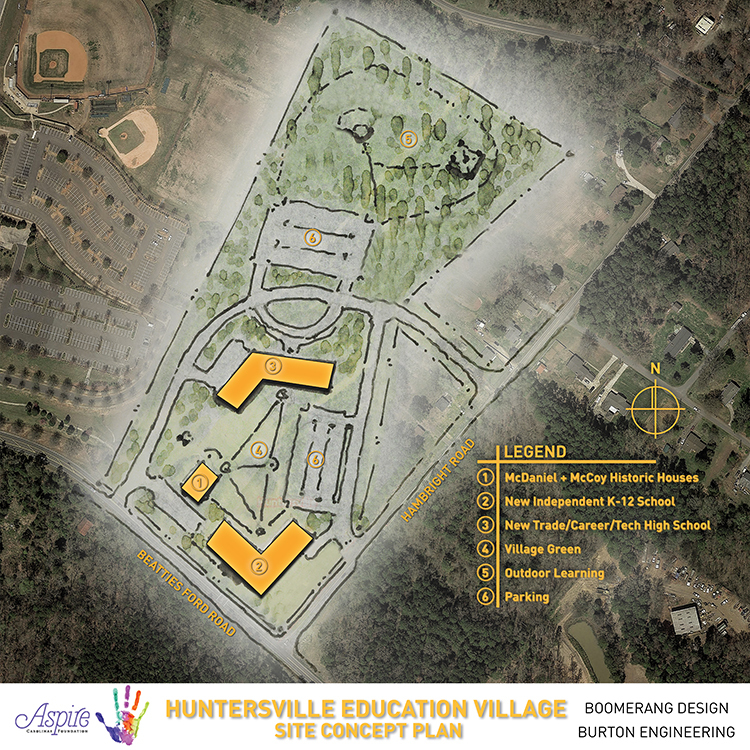 The Huntersville campus will be home to a K-12 school offering specialized education and small classes to children with learning differences, and a school for children with Asperger’s/autism spectrum disorders for grades 3-8 focused on their social, communication and educational needs. The third school will be the first charter trade school in North Carolina specifically dedicated to having high school graduates fully qualified in a trade upon graduation. The first school will be housed in a renovated 6,000 sq. ft. home currently on the property. The peaceful ambiance and large rooms will be ideal for classrooms to serve the special needs of our 3rd – 8th grade students. Construction of a new 60,000 sq. foot building includes dedicated space for up to 75 Asperger’s and autism spectrum students. Often referred to as a “school within a school” this synergetic arrangement allows the LD and Asperger’s/autism spectrum schools to share resources. The building will include classrooms for lower-, middle-, and upper-school students, and features shared LD-Asperger’s/autism spectrum spaces like a dining hall, gymnasium, music room, art room, counselor offices, a central receptionist desk, and school administrative offices. This new 70,000 sq. ft. school will be an airy and bright modern space conducive for technical learning. Upon graduation the students will be fully qualified to begin a career in their chosen trade with a local business or company. Students will have varied curriculum choices in advanced manufacturing, construction trade, and other vocational offerings. These courses will offer fully hands-on training, rather than purely theoretical teaching. The students will be prepared to begin work in their chosen trade upon graduation. At full enrollment this school will serve 400 plus students within the region. Aspire Carolinas Foundation board members include Dale Halton, Marty McCarthy, James Secunda and Sarah McAulay, the former Huntersville Town Commissioner. Please can you tell me how we get on a list for this school!!! When will it open? My grandaughter is on the spectrum and desperately needs this school! She will be going into 6th grade next fall.